About a month ago, Walgreens was having a wicked clearance on a few Borghese polishes and I picked one up called Stellare Notte. It caught my eye in the fluorescent aisle because I distinctly saw duochrome shimmer flashing at me out of the bottle. Sold! Once I got it home though, it sat in my untried drawer until today. After trying another one of Borghese's shades (remember Almondine and that awful, terrible brush?) I put off wearing it. My curiosity couldn't handle it though. Today I busted out this interesting dark beauty. The application was fantastic, and the brush in this particular bottle was a bit better. No bad bristles but the cut on the brush was quite jagged and rough, like a piranha had chomped on it. Flash, lightbox. See how that shows off the teal? No flash, lightbox. Purple! Glorious purple! Anyways, it's really beautiful. If you like dark, sultry, seductive polishes that provide a wink of purple and teal- this is your lacquer. Not bad for a $2 score, eh? All pictures were taken with 1x Essie First Base, 3x Stellare Notte, 1x CND Super Shiney. 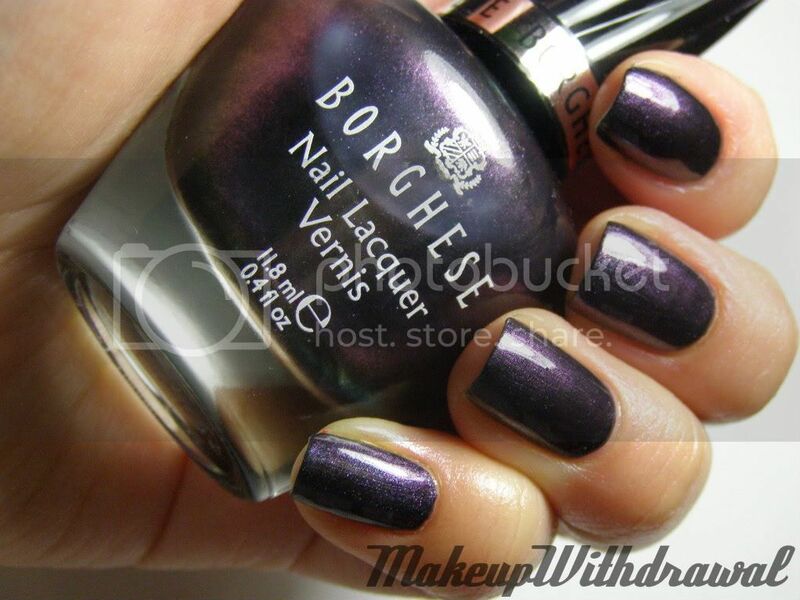 Have you tried Borghese Stellare Notte? What's your favorite dark polish?